Q1. How to perform arithmetic operations using expr? Q2. How to perform comparison operations using expr? Q3. How to perform string-related operations using expr? Sometimes, while working on the command line (especially when dealing with a shell script), you may find yourself in a situation where you have to perform actions like searching for a substring in a string, finding its index, as well as other things like performing comparisons and arithmetic operations. For those who aren't in the know, there exists a command line utility - dubbed expr - that lets you do all this. In this tutorial, we will discuss the basics of this command along with some of the features it provides. Please note that all examples and instructions mentioned here have been tested on Ubuntu 16.04LTS. Following are some Q&A-style examples that'll give you a good idea about how this tool works. which is clearly wrong, and not what we expect. Note that the aforementioned command will only produce 3 in output. 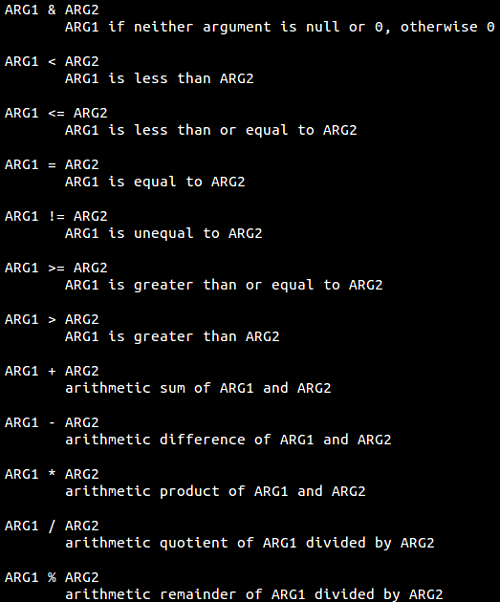 In case you want to see the remainder, use the % operator. The expr command also lets you perform comparison operations in various ways. For example, the following command (third in the screenshot below) will return ARG1 if it is neither null nor 0, otherwise ARG2. Please note that the backslash before pipe is used as an escape character as pipe is otherwise treated as a built-in shell operator. Similarly, you can perform a lot of operations. Following screenshot - taken from the command's man page - should give you a good idea regarding what kind of comparisons you can do with the expr command. In case the string contains spaces, you need to use the escape character. As you'll likely agree, expr is a feature-rich command, but yet easy to understand and simple to use. Here, in this tutorial, we've tried to provide you information regarding most of the basic features it offers. Once you're done practicing these, you can head to the tool's man page to learn more about it. A question I have is: does expr start counting at 0 when looking at length or does it start with one? From the given examples, they seem to indicate the latter.